All these are zipped HEX files. Hex is short for HEX-Intel, an interchange format knwon to most stand alone EPROM programmers. Conversion from and to HEX can be done with hexbin. Note that these ROMs contain copyrighted (but abandoned) software. If someone has a problem with this, let me know. Intext 1.0 Talbot Intext word processor 1.0 with communication (16 kByte ROM). Intext 1.1 Talbot Intext word processor 1.1 with communication (32 kByte ROM). Oval "IRM" 2.7 Integrated Resource Manager (16 kByte ROM). CardBox "Business Simulations Portable Cardbox - Plus", reconstructed ROM. CardBox is still in business. 602 same source as 601. Manudax Utilities DU.COM, DUMP.COM, FILINK.COM, PIP.COM, SD.COM, ZSID.COM. RAMTEST A PX-4 & PX-8 D-RAM test OS replacement. Disassembly included. Turbo Pascal 3.01 thanks to Peter Dassow. I added a hex version for real EPROM programmers. Turbo Pascal 3.01, no backup file thanks to Peter Dassow. I added a hex version for real EPROM programmers. font file for the HC-80/PX-8. The FONT.ROM is from Toshiya TAKEDA. the FONT.TXT is an editor friendly view of the contents. The following ROMS are tested only with the emulator and will work with the latest version (2017-04-02) only. Previous versions of the emulator did not support ROM sizes other than 32 kByte. 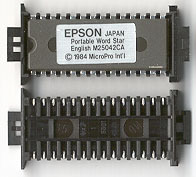 The PX-8 uses special cradles to insert (EP)ROMs, but these are not essential. If you bend all the pins untill they point all exactly downwards, you can insert an EPROM without a cradle with some care. The cradle socket connect pins fixate the EPROM pins. Be careful with removing the EPROM, as too much sideways force might bend the socket connections. The words ROM and EPROM are used almost interchangeble, and in most cases they are. Only if you want to (re)program one there is a difference. With true ROMs, you can't. With EPROMs, you need an eraser (UV-C source) and a programmer.